We are turning our balcony to a kitty jail! 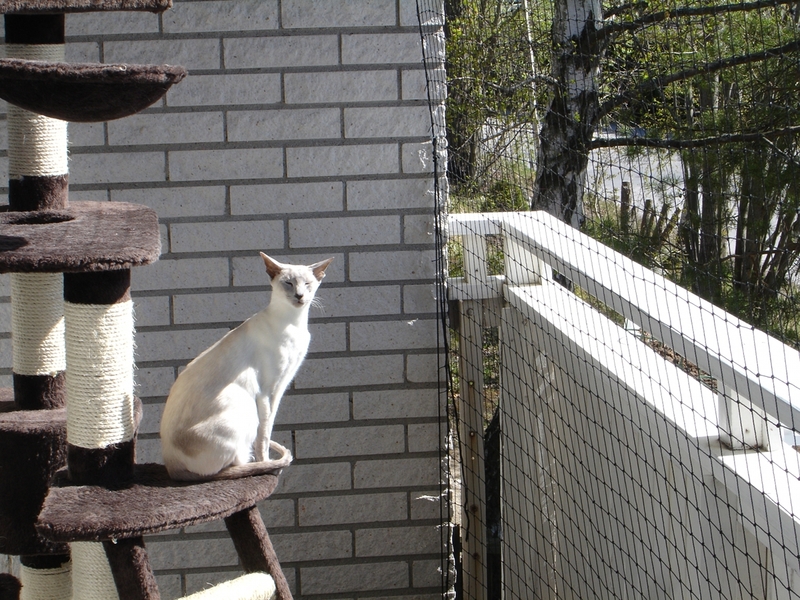 Kitty jail – the net is put! The cats are exploring the new floor. We have a lot also, some 1200 sqm, and Maven, Leroy and Miii go out and run there when we are out. Maven even takes walks with us through our neighborhood, without a leash. Miii and Leroy are pretty disciplined, but Maven is best in that aspect of all of our cats. Jossan is not too obedient, and Albert never showed any interest (so far) in going out. We took Jossan out on leash since we moved here, when she was not pregnant, (it is not like a dog leash, Jossan has a little vest and a rope attached to it, at her back, it does not go around her neck. It is comfortable for her!). Jossan used to go out without vest before we moved, but she was a bit stubborn and did not come immediately every time I called her. 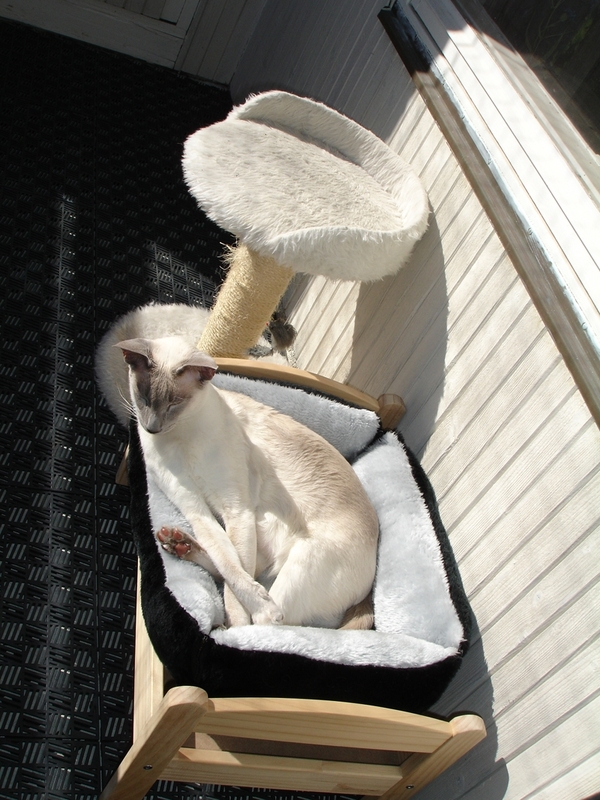 Leroy – living a fat cat’s dream – you are out without having to go down the stairs! And your bed is out too! It is good for cats to get fresh air, but under controlled forms; too many cats die in traffic or kill birds and cute small animals. I know they are predators, but I find it very hard to think of our fluffy balls as cold-blooded killers. Maven knows what I think about her killings; I screamed in horror every time she brought me dead, half dead and even – alive and unharmed ‘presents’. She was very bad when she was younger. She did not kill any bird or a mouse in about two years now. Leroy caught flies a few times, and Miii found a snail once in the garden and was very proud about that. 🙂 She yelled and meawed so that everyone in Stockholm heard about her ‘catching’ a snail. Jossan is a real killer, and Albert would be the same. And I am not sure how obedient he would be. He is like his mom. An independent kitty. Independent cats cannot go out and do whatever they want. But they should get fresh air. 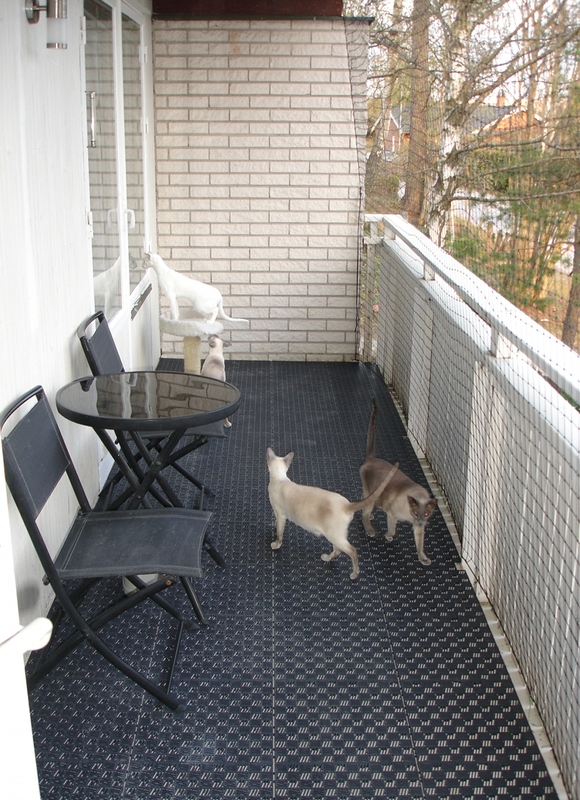 We bought a plastic black net (black so that birds can see it; then they do not fly into it) and plastic tiles for the balcony. We only started arranging the kitty jail and they seem to like it so far. 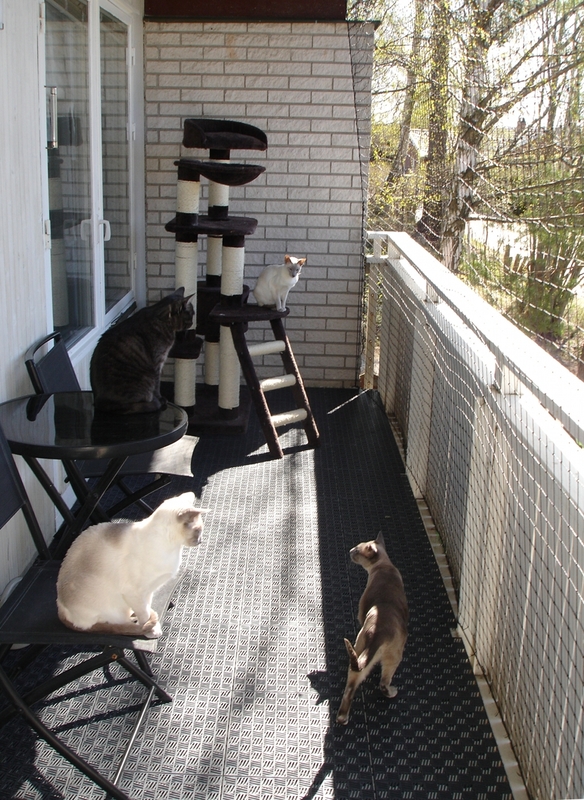 Leroy, Miii and Maven still get to go out to the lot as well as to the balcony when it is sunny. Jossan is pregnant, so going out to the balcony is very good for her; she can get some fresh air that way. Cats really love to feel the wind, sniff all the exciting smells and listen to birds. Happy cats! We will put more shelves and some plants (the question is – which plants are at the same time not poisonous for cats and taste so bad that Albert would let them grow? Hmmm). It will take time, but we are looking forward to the project! Hi, great idea! what type of net is that? what is it made of and where did you get it? Thanks!